Applications must be submitted on the Application for Employment form (Z83) – please print or obtain it from any Public Service department. Please note that applications must not be sent via e-mail. Hardcopies must be posted to our HR division as indicated on each advertisement. E-mailed applications are not considered as valid. Your application should be accompanied by certified copies of qualifications, a driver's license and a CV (where applicable). View information on Legal and Other Related Careers in the Justice System. Check your Qualifications and Part Qualifications on the SAQA website. You can also request the evaluation of foreign qualifications via the Foreign Qualifications Evaluation and Advisory Services (DFQEAS). The Department of Justice and Constitutional Development (DOJ&CD) is offering internship opportunities to provide South African matriculants and graduates with the opportunity to gain workplace experience in the field that they have studied. SALARY: R934 428 – R1 460 616 per annum (Salary will be in accordance with OSD determination). The successful candidate will be required to sign a performance agreement. REQUIREMENTS: An LLB Degree or 4 year recognized qualification; At least eight (8) years appropriate post qualification litigation experience; Admitted as an Advocate of the High Court; Proven track record of managerial experience will be an added advantage; A valid driver’s licence. KEY PERFORMANCE AREAS: Execute the mandate of the Office of the Family Advocate; Perform all functions and duties of the Senior Family Advocate (Head of Office) in accordance with relevant legislation and departmental delegations; Ensure effective and Efficient institutional performance of the relevant Office of the Family Advocate; Manage and ensure effective and efficient service delivery at the various service points within the respective jurisdiction (Head of Office), Performance Management, conduct advanced enquiries, training, mentoring and coaching of all occupational classes in the Office; Ensure compliance with policies and procedures by all staff members; Identification and implementation of Risk Management Plan; Reporting to the Principal Family Advocate. SALARY: R448 269 – R1 084 437 per annum (Salary will be in accordance with OSD determination). The successful candidate will be required to sign a performance agreement. DUTIES: Key Performance Areas: Monitor and advice on conductive determinations and assessment of Estate duties; Monitor and review all legal and administrative operations at the Office of the Master of the High Court; Ensure effective and efficient delivery of service, financial and human resource management within the Office of the Master; Draft legal documents that provide clear justification; Mediate and conciliate disputes by advising on the outcome of its resolution. S: Quoting the relevant reference number, direct your application to: Postal address: The Human Resources: Department of Justice and Constitutional Development, Private Bag X81, Pretoria, 0001.OR Physical address: Application Box, First Floor Reception, East Tower, Momentum Building, 329 Pretorius Street, Pretoria. PACKAGE: R697 011.00 – R821052.00 per annum (All inclusive). The successful candidate will be required to sign a performance agreement. KEY PERFOMANCE AREAS: Exercise quality assurance services over administrative duties related to all resources i.e Finance, Human Resources, Procurement and Court operations; Co-ordinate strategic and business planning processes as well as the facilities, physical resources, information and communication related to courts; Manage assessment of physical resources; Compile annual performance and statutory reports to the relevant users; Develop and implement customer service improvement strategies; Manage misconduct and maladministration investigations; Provide effective people management. APPLICATIONS KIMBERLY: Quoting the relevant reference number, direct your application to: Postal address: The Regional Head: Justice and Constitutional Development, Private Bag X6106, Kimberley, 8300. OR hand delivers at the New Public Buildings, (Magistrates Court) of Knight and Stead Streets, 7th floor, Kimberley, 8301. Email or faxed applications will not be considered. SALARY: R697 011 - R821 052 per annum (All inclusive remuneration package). The successful candidate will be required to sign a performance agreement. REQUIREMENTS: An appropriate recognized three year B degree (NQF level 6) in an Accounting, Finance, or Auditing related field, or equivalent qualification with Accounting as Major; A minimum of 5 years relevant financial experience of which at least 3 years must be as an Assistant Director in a financial field; PLUS the following key competencies: working knowledge and experience on BAS and PERSAL, Advanced knowledge of the PFMA and Treasury regulations, A valid driver’s licence. SKILLS AND COMPETENCIES: Proven managerial, pro-active problem solving, verbal and written communication, supervisory skills; accuracy and attention to detail; advanced computer literacy (MS Office), the ability to work under pressure and meet deadlines. KEY PERFORMANCE AREAS: Oversee and manage the following: Financial Accounting, Management Accounting, Financial: Statement Reporting, Payroll Management, Cash Management, Debts Management, Compliance: monitoring, and Audit facilitation functions in the Department; Provide a support service to the Regional: Head and all other managers in the Northern Cape region in the execution of their functions in terms of the Public Financial Management Act of 1999 and Treasury Regulations; Establish and maintain appropriate systems and internal control measures to ensure effective and efficient risk management, internal control, financial compliance, and resource management; Formulate creative and innovative solutions to enhance cost effectiveness and efficiency in output measures; Responsible for training and development of staff employed in the financial expenditure management section; Assist the Regional Head in the prevention of unauthorized, irregular, and fruitless expenditure, any additional ad-hoc functions assigned. ENQUIRIES: KIMBERLEY: Ms Ronel de Klerk  (053) 802 1346. APPLICATIONS: NORTHERN CAPE: Quoting the relevant reference number, direct your application to: Postal address: The Regional Head: Justice and Constitutional Development, Private Bag X6106, Kimberley, 8300. OR hand delivers at the New Public Buildings, (Magistrates Court) of Knight and Stead Streets, 7th floor, Kimberley, 8301. Email or faxed applications will not be considered. APPLICATIONS: EAST LONDON: Quoting the relevant reference number, direct your application to: The Regional Head, Private Bag X9065, East London, 5200. REQUIREMENTS: An LLB or 4 year recognized legal qualification; Admission as an Attorney; At least 4 years appropriate post qualification legal litigation experience; The right of appearance in the High Court of South Africa will be an added advantage; Admission as a conveyancer will be an added advantage; A valid driver’s licence. SKILLS AND COMPETENCIES: Legal research and drafting; Case flow management; Computer literacy; Communication skills (written and verbal) with ability to moderate and lead people; Supervisory and mentoring skills; Creative and analytical; Problem solving and conflict management; Accuracy and attention to detail. KEY PERFORMANCE AREAS: Guide and train Candidate State Attorneys; Handle litigation and appeals in the following Courts; Magistrates, High, Labour Courts, CCMA, Supreme Court of Appeal, Constitutional Court, Land Claims, Tax and Tax Tribunals; Draft and/or settle all types of contract on behalf of various clients departments; Render legal opinions and advices; Deal with all forms of arbitration, including inter-departmental arbitrations; Render conveyancing and notarial services. 2. A current certificate of good standing from the relevant Law Society must accompany the application. 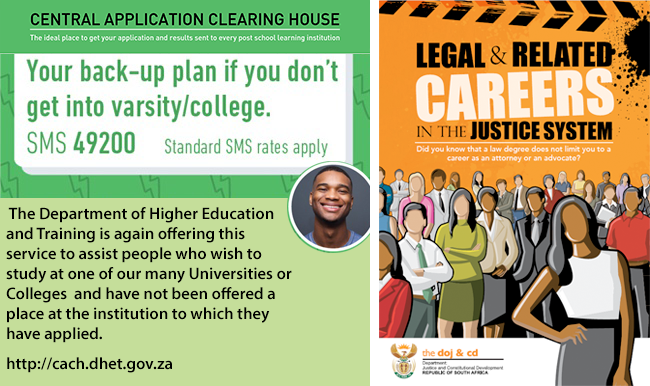 APPLICATIONS: Quoting the relevant reference number, direct your application to: Postal Address: The Human Resource: Department of Justice and Constitutional Development; Private Bag X81, Pretoria, 0001.OR Physical Address: Application Box, First Floor, Reception, East Tower, Momentum Building, 329 Pretorius Building, Pretoria, 0001. SALARY: R444 693 – R523 818 per annum. The successful candidate will be required to sign a performance agreement. SKILLS AND COMPETENCIES: Strong leadership and management capabilities; Strategic capabilities; Good communication (written and verbal); Computer literacy. KEY PERFORMANCE AREAS: Co-ordinate and manage the financial, human resources, risk and security in the court; Manage the strategic and business planning processes; Manage the facility, physical resources, information and communication related to courts; strategies; Lead and manage the transformation of the office; Manage the projects intended to improve court Compile and analyze court statistics to show performance and trends; Support case flow management at the court; Compile annual performance and statutory reports to the relevant users; Develop and implement customer service improvement management; Manage service level agreements. APPLICATIONS: KIMBERLEY: Quoting the relevant reference number, direct your application to: Postal address: The Regional Head: Justice and Constitutional Development, Private Bag X6106, Kimberley, 8300. OR hand delivers at the New Public Buildings, (Magistrates Court) of Knight and Stead Streets, 7th floor, Kimberley, 8301. Email or faxed applications will not be considered. SALARY: R356 289 – R419 679 per annum. The successful candidate will be required to sign a performance agreement. REQUIREMENTS: Bachelor’s Degree/National Diploma in Office Administration or equivalent qualification; At least 3 years’ experience in Administration environment; Knowledge of finance, procurement directives and procedures; Knowledge of all legislation and policies that inform the Department’s administrative support activities; Knowledge of the core functions of the Masters Office; A valid driver’s license. SKILLS AND COMPETENCIES: Communication skills (verbal and written); Computer literacy (MS Office); Financial management; Leadership and decision making; Analytical and presentation skills; Negotiation and numerical skills. KEY PERFORMANCE AREAS: Prepare all financial reports prescribed and required by management in accordance with general accepted administration practice; Provide required office administrative expertise; Manage documents and undertake policy or line function tasks as required; Coordinate external strategic alliances between the office and other stakeholder; Manage general support and resources services in the office; Provide effective people management. NOTE:	People with disabilities are encouraged to apply. APPLICATIONS: Quoting the relevant reference number, direct your application to: Postal address: Human Resource: Department of Justice and Constitutional Development, Private Bag X81, Pretoria, 0001. OR Physical address: Application Box, First Floor Reception, East Tower, Momentum Building, 329 Pretorius Street, Pretoria. SKILLS AND COMPETENCIES: Communication (writing verbal, written and oral) skills; Excellent writing skills; Training skills; Computer skills (Ms Word, Powerpoint, Outlook and Internet, etc); Problem solving and Analysis; Change Management; Presentation skills; Project Management; Ability to offer lessons and practical training; Interpersonal relations; Planning and organizing; Ability to operate presentation equipment; Customer service orientation; Ability to work independently, under pressure and meet deadlines; Understanding of confidentiality in government; Diversity Management; Extensive travelling. REQUIREMENTS: 3 year Bachelor’s Degree/ National Diploma or equivalent qualification in Finance/ Accounting; 3 years relevant experience in Finance environment; Knowledge of Public Finance Management Act (PFMA), Treasury Regulations, Departmental Financial Instructions (DFI), Public Service Act and other relevant legislation; Knowledge/ experience in recognized Accounting software will be an added advantage. SKILLS AND COMPETENCIES: Computer literacy (MS Word, Excel, Power Point and Outlook); Communication skills (verbal and written); Interpersonal relations; Creative thinking; People Management; Technical proficiency; Analytical skills; Planning and organizing. KEY PERFORMANCE AREAS: Oversee verification of applications received and ensure daily payments; Administer and manage guardian’s Fund and compile reconciliation statements; Prepare report on fraud cases, interest losses, monitor the guardians funds cash flows; Provide effective people management. APPLICATIONS: Quoting the relevant reference number, direct your application to: Postal address: The Human Resources: Department of Justice and Constitutional Development, Private Bag X81, Pretoria, 0001.OR Physical Address: Application Box, First Floor, Reception, East Tower, Momentum Building, 329 Pretorius Building, Pretoria, 0001. REQUIREMENTS: An LLB or 4 year recognized legal qualification; Admission as an Attorney; At least 2 years appropriate post qualification legal/litigation experience; Right of appearance in the High Court of South Africa; A valid driver’s licence. SKILLS AND COMPETENCIES: Legal research and drafting; Dispute resolution; Case flow management; Computer literacy; Strategic and conceptual orientation; Communication skills (written and verbal). KEY PERFORMANCE AREAS: Handle litigation and appeals in the High Courts, Magistrate’s Court, High Labour, CCMA, Supreme Court of Appeal, Constitutional Courts, Land Claims, Tax and Tax Tribunals; Draft legal documents and conduct legal research; Draft and/or settle all types of contracts on behalf of the various client departments; Preside over all forms of arbitration, including inter-departmental arbitrations; Furnish legal advice and opinions; Guide and train support staff; Draft, prepare and register conveyancing documents. NOTE:	1. People with disabilities are encouraged to apply. SALARY:	R257 256-R298 230 per annum. (Salary will be in accordance with the OSD determination).The successful candidate will be required to sign a performance agreement. REQUIREMENTS: Bachelors Degree in Social Work or equivalent qualification which allows for professional registration with the SACSSP; A minimum of 7 years appropriate experience in Social Work after registration as Social Worker with the SACSSP ; A minimum of 5 years proven Social Work Supervisory Experience; Knowledge and experience in Mediation; Court experience in Evidence; Knowledge and application of Family Law, including Mediation in certain Divorce matters Act, Maintenance Act and Domestic Violence Act, Children’s Act (inclusive of Hague Convention on International Child Abduction); A valid driver’s license. SKILLS AND COMPETENCIES: Supervisory skills; Computer literacy (MS Word); Communication (written and verbal) skills; Mediation, Interviewing, conflict resolution, evaluation and report writing skills; Diversity and conflict management; Attention to detail. KEY PERFORMANCE AREAS: Assist in the supervision of the work of Family Counsellors; Conduct mediation and/or inquiries as part of a multi-disciplinary team in custody, access, guardianship, child abduction and related Family Law disputes; Evaluate information and compile forensic court reports and make recommendations to the best interest of children in family law disputes; Act as expert witness for the Family Advocate in Court; Network and conduct awareness campaigns regarding the functions and role of the Office of the Family Advocate; Travel to townships and rural areas to conduct inquiries and interview parties and source references in Family Law disputes. Postal address: The Regional Head: Justice and Constitutional Development, Private Bag X6106, Kimberley, 8300. OR hand delivers at the New Public Buildings, (Magistrates Court) of Knight and Stead Streets, 7th floor, Kimberley, 8301. Email or faxed applications will not be considered. SALARY: R245 694 – R867 399 per annum. (Salary will be in accordance with OSD determination). The successful candidate will be required to sign a performance agreement. REQUIREMENTS: An LLB Degree or a 4 year recognized legal qualification; At least 2 years appropriate post qualification legal experience; Sound knowledge of the South African Legal system, (including Constitutional Law) as well as the application of International Law; Knowledge of Multi Departmental Research; A valid driver’s license. KEY PERFORMANCE AREAS: Conduct legal research, analyze, advise and make recommendations; Develop legal theories around the identified focal points; Draft legal reports and present them to the relevant stakeholders; Assist the Chief Director: Research with coordination within the Branch at a lower level. SALARY: R242 064 – R867 399 per annum. (Salary will be in accordance with OSD determination). The successful candidate will be required to sign a performance agreement. REQUIREMENTS: LLB Degree or four years recognized legal qualification; At least 2 years appropriate post qualification legal experience; Knowledge of the Administration of Estates Act, Compliance Act, Mental Health Act, Insolvency Act, Companies Act, Close Corporations Act, Trust Property Control Act and other relevant legislation; Experience in the functional field and services provided by Master’s of the High Court; A valid driver’s license. SKILLS AND COMPETENCIES: Estate duties; Case flow management; Trust; Administration of estates; Legal research and drafting; Planning and organizing; Dispute Resolution; Time management; Communication skills; Ability to work under pressure and independently in a highly pressurized environment. KEY PERFORMANCE AREAS: Manage the administration of Deceased Estates, Insolvent Estates, Trust and Curatorship; Provide strategic direction to the office; Ensure that departmental policy, procedures and legislations are implemented; Manage the operations regarding the Guardian’s Funds and resources in the office; Ensure continuous quality improvement of processes and policies. APPLICATIONS: Quoting the relevant reference number, direct your application to: Postal address: The Human Resources: Department of Justice and Constitutional Development, Private Bag X81, Pretoria, 0001. OR Physical address: Application Box, First Floor Reception, East Tower, Momentum Building, 329 Pretorius Street, Pretoria. SALARY: R186 828 - R332 823 per annum (Salary will be in accordance with OSD determination). The successful candidate will be required to sign a performance agreement. REQUIREMENTS: LLB Degree or recognised 4 year legal qualification: Extensive knowledge of the maintenance system and family law matters: Proficiency in the following languages; Setswana, English and Afrikaans. IsiXhosa will be an added advantage: Knowledge of Maintenance Act (Act 99/1998): Understanding of all services and procedure in the area of Maintenance and other areas; A valid driver’s licence. SKILLS AND COMPETENCIES: Excellent communication skills ( verbal and written); Computer literacy(MS Office); Numeracy Skills; Communication skills; Facilitation and mediation skills; Litigation skills; Legal terminology and process in simple language skills; Good interpersonal relations; Innovative and work under pressurized environment. SALARY: R186 828 per annum. (Salary will be in accordance with OSD determination). The successful candidate will be required to sign a performance agreement. REQUIREMENTS: An LLB degree or recognized four years legal qualification. SKILLS AND COMPETENCIES: Legal research and drafting; Case flow management; Estate duties; Trust; Dispute resolution; Communication skills (verbal and written); Problem solving; Customer focus; Attention to detail; Computer literacy. NOTE: Interested applicants may visit the following website: www.justice.gov.za or www.dpsa.gov.za to view the full job specification of the above positions. Applications must be submitted on Form Z83, obtainable from any Public Service Department or on the internet at www.gov.za. A Z83& CV must be accompanied by original certified copies of qualifications and identity document. A driver’s licence must be attached if indicated as a requirement. A SAQA evaluation report must accompany foreign qualifications. Applications that do not comply with the above mentioned requirements will not be considered. All shortlisted candidates for SMS posts will be subjected to a technical exercise that intends to test relevant technical elements of the job, the logistics of which will be communicated. Following the interview and technical exercise, the selection panel will recommend candidates to attend a generic managerial competency assessment (in compliance with the DPSA Directive on the implementation of competency based assessments). The competency assessment will be testing generic managerial competencies using the mandated DPSA SMS competency assessment tools. The successful candidate will complete a financial disclosure form and also be required to undergo a security clearance. If the candidate is applying for an OSD post, certificates of service must be attached to the CV. The DOJ&CD is an equal opportunity employer. In the filling of vacant posts the objectives of section 195 (1) (i) of the Constitution of South Africa, 1996 (Act No: 108 of 1996), the Employment Equity imperatives as defined by the Employment Equity Act, 1998 (Act No: 55 of 1998) and relevant Human Resources policies of the Department will be taken into consideration. Reasonable accommodation shall be applied for People with Disabilities including where drivers licence is a requirement. Shortlisted candidates will be subjected to a personnel vetting process. Correspondence will be limited to short-listed candidates only. If you do not hear from us within 3 months of this advertisement, please accept that your application has been unsuccessful. The department reserves the right not to fill these positions. Women and people with disabilities are encouraged to apply and preference will be given to the EE Target.